part in 4 directions. 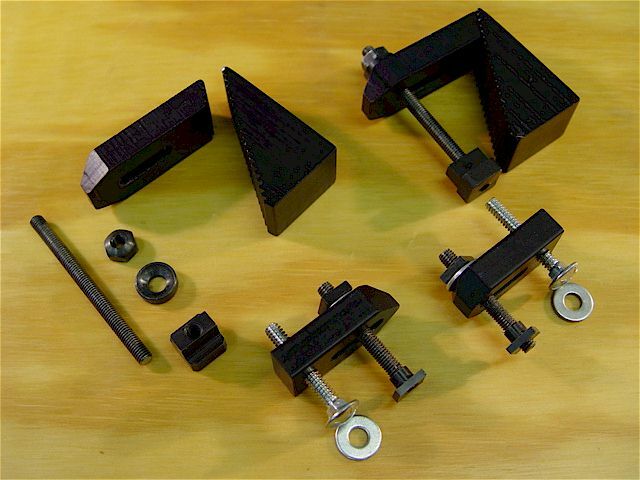 Exchanging the same sized parts is easy accomplished by loosening & tightening only 2 jaws. 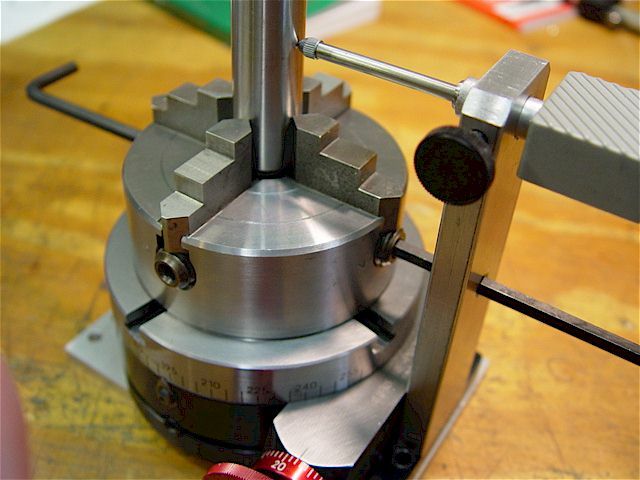 Used a properly sized dowel to perform the initial spindle to table alignment. Completed the rotary table tram with a dial test indicator. 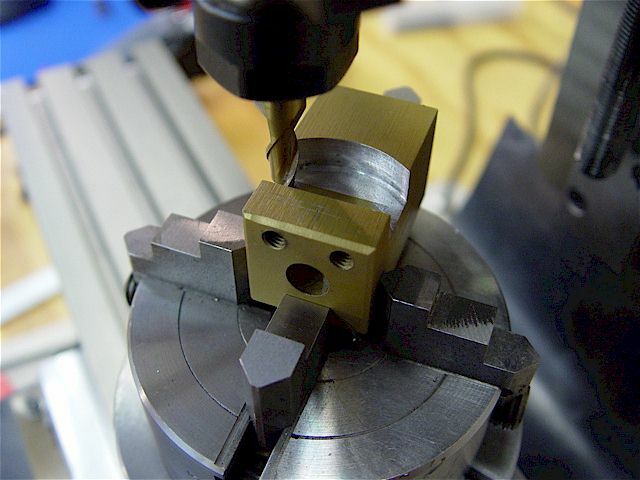 Milling operation to make a rocker tool post is shown. 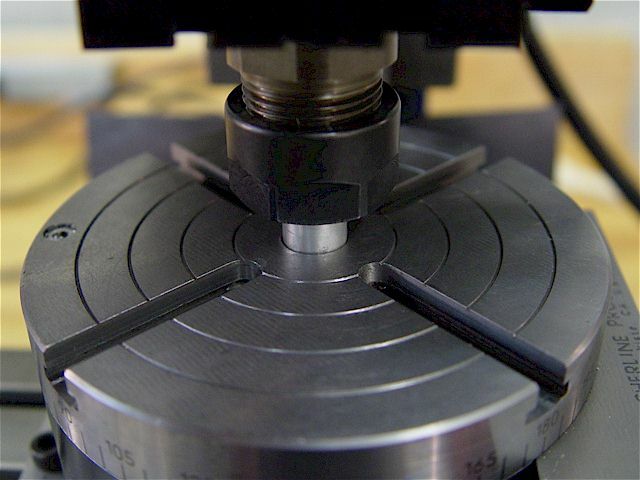 Using a center finder to set the part's center of rotation. 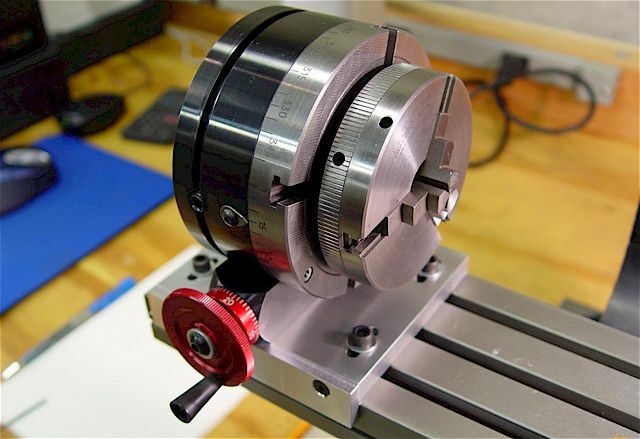 The mill table x-axis is then moved the radius of the semi-circular cut compensating for the cutter radius. 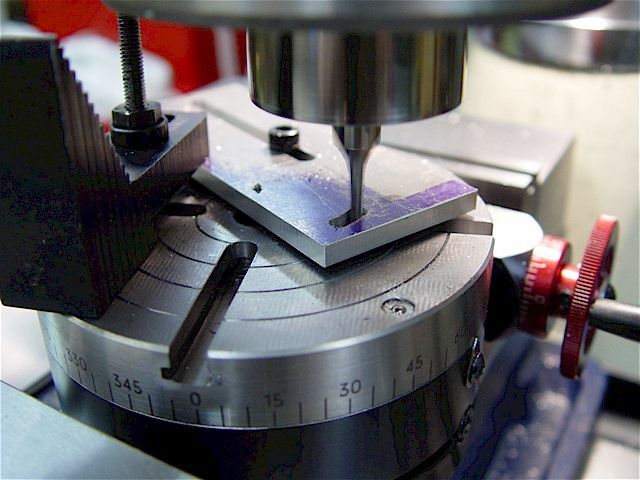 Shown is a 1/4" end mill cutting a 1-1/2" diameter curve. 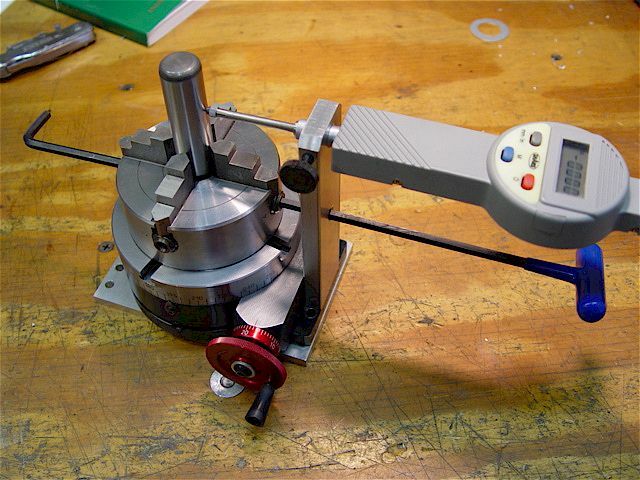 Procedures & formulas for rotary table use are described in Sherline's instructions. Two disks aligned using 1/4" dowel pins in the 1/4" slots. A washer spaces them above the table surface. 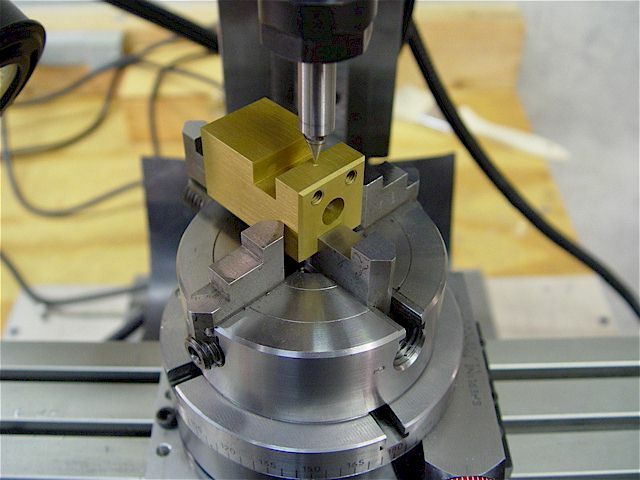 Milled four, 1/4" diameter 0.127" deep notches every 90 deg. The small (right) notches are witness marks. 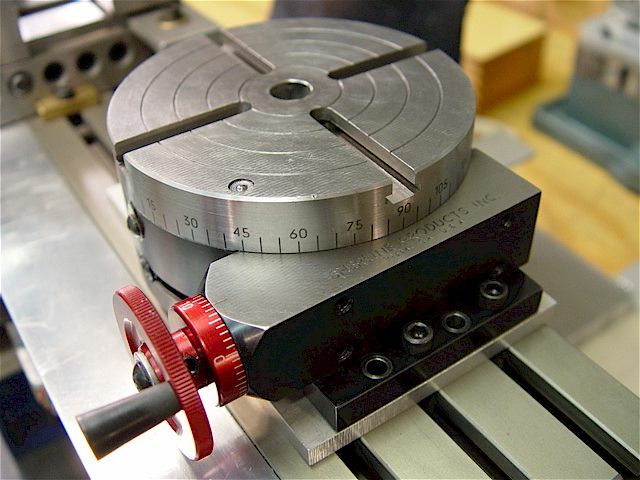 Using a 2nd, 4-inch rotary table, made a bracket to hold the gage while centering work in the small 4-jaw. 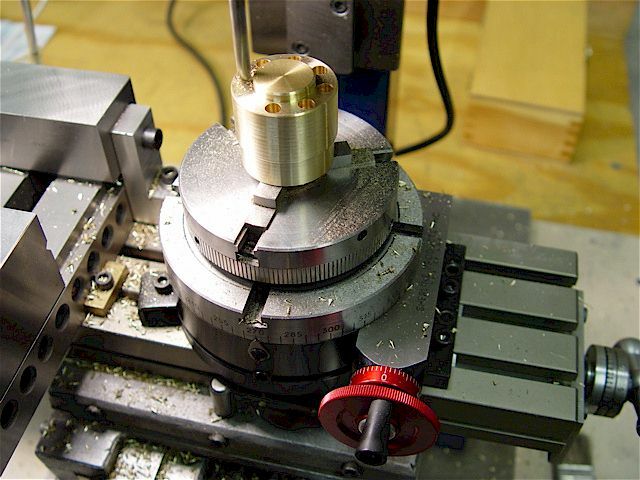 I can quickly center the work piece while at the bench, then transfer the 4-jaw to the 4th-axis of the CNC mill. 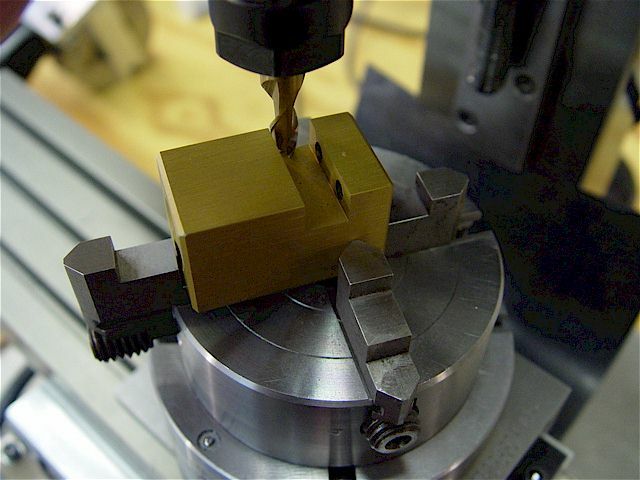 This is for an initial centering only; the final tramming is performed after it has been transferred to the mill. 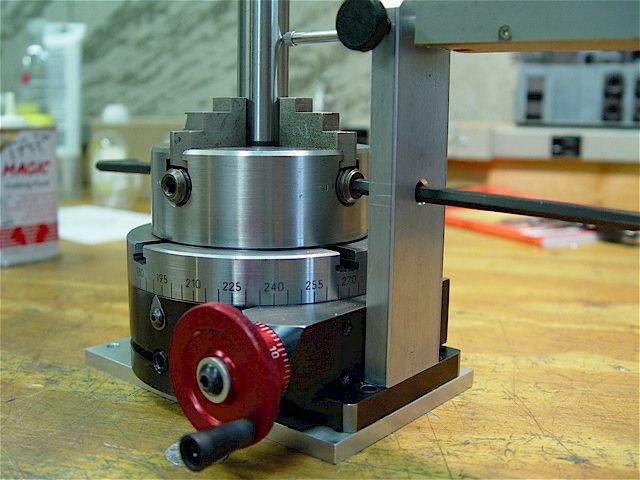 This is an 8mm stemmed gage but the sleeve can be removed to allow holding a 3/8-inch stemmed dial gage. 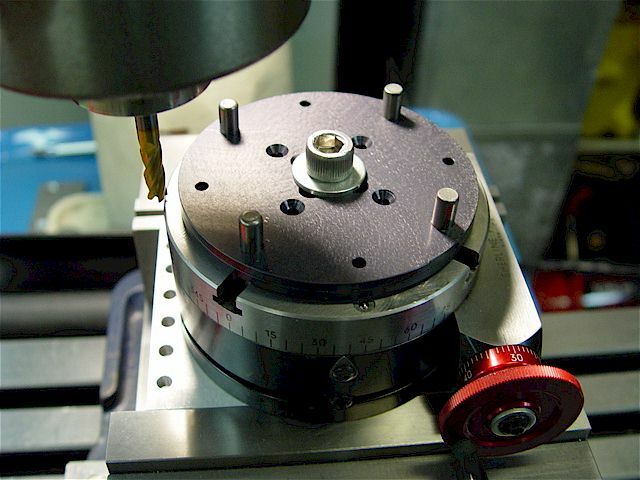 Drilling eight, #7 holes every 45 deg for 1/4-20 hand tapping. 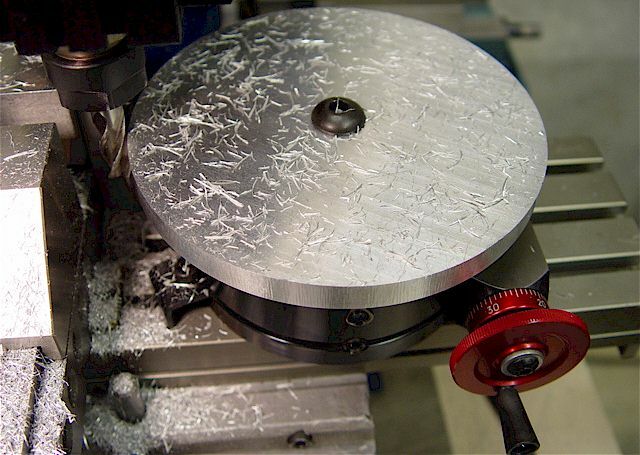 Making a round, chuck to rotary table adapter plate. 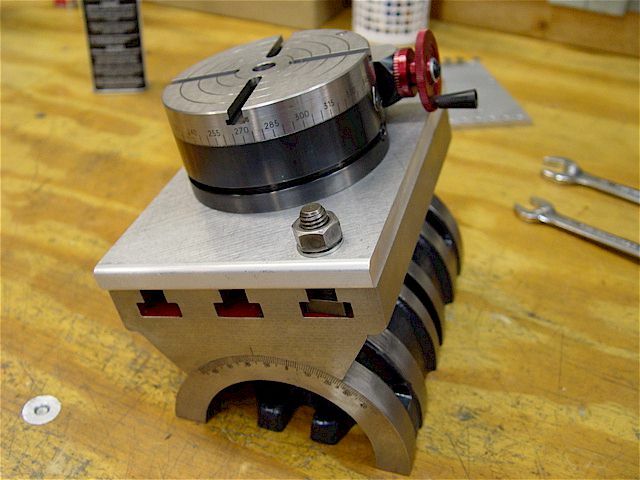 Rotary table with one-inch vise attached. 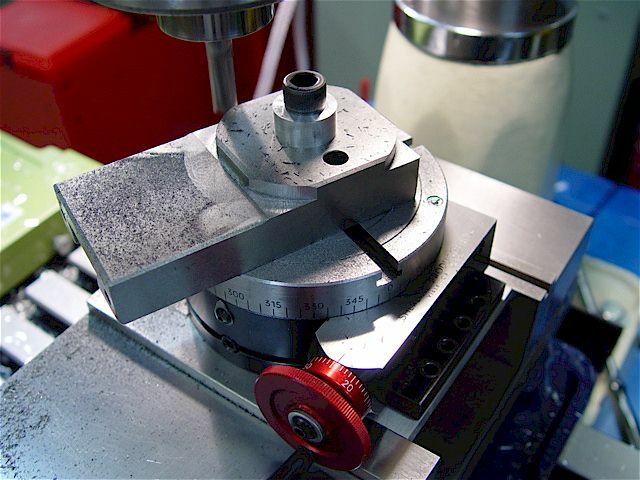 Having perpendicular slots allows the most two-way adjustability. 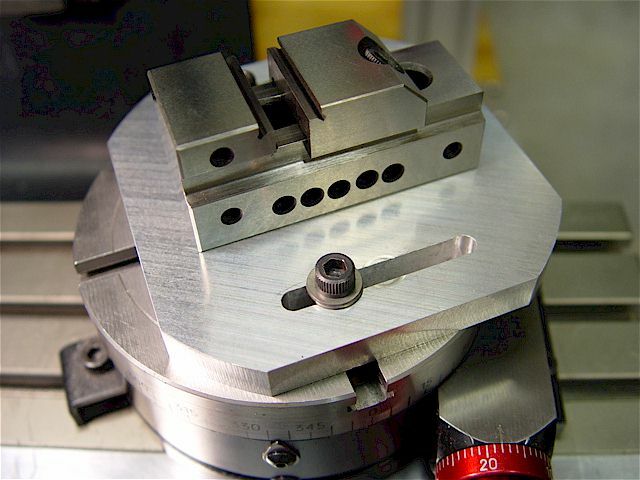 The hardened screwless vise has M4-0.7 pre-tapped holes on the bottom & built-in parallels. 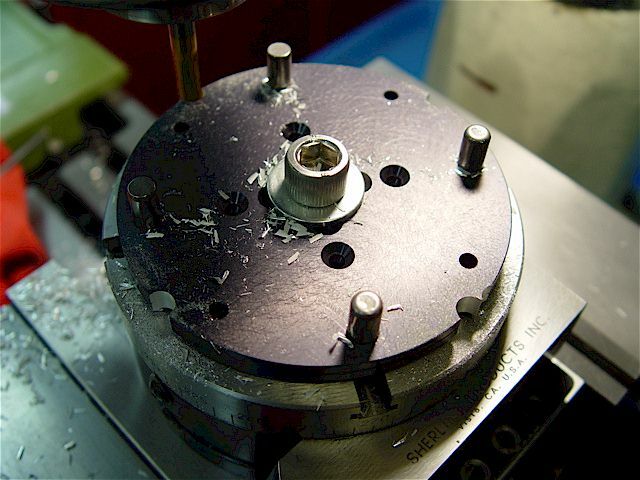 holes that align with the Taig mill table T-slots to allow direct mounting using 10-32 cap-head bolts. 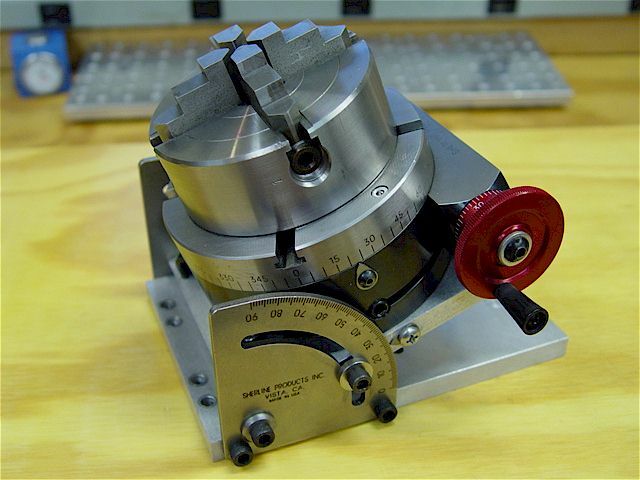 The toe-clamp sets can be used for the Taig Micro Mill & the Sherline 4-inch rotary table. 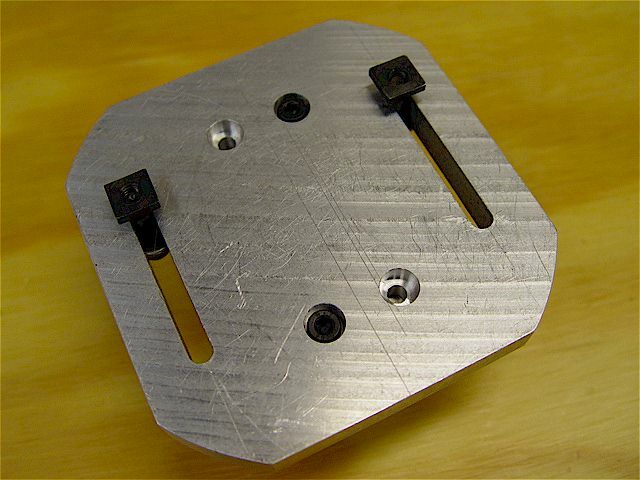 Right-angle bracket for the 4" rotary table. Added the edge guide for easier set up. 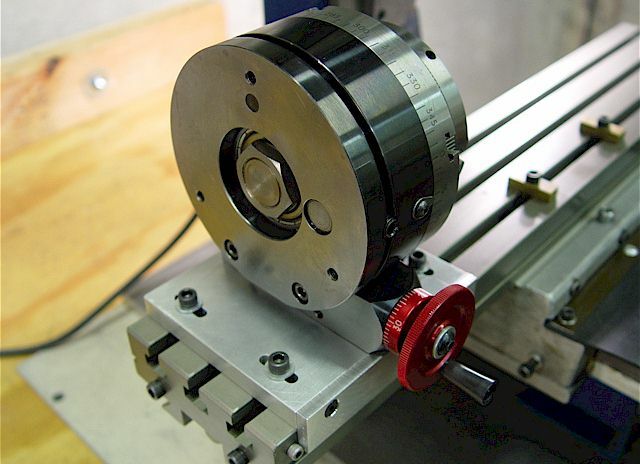 Taig 4-jaw chuck mounted onto a Sherline tilt table. Made an adapter plate to mount the 4" rotary table centered on the tilt table. There is a 25-lb. 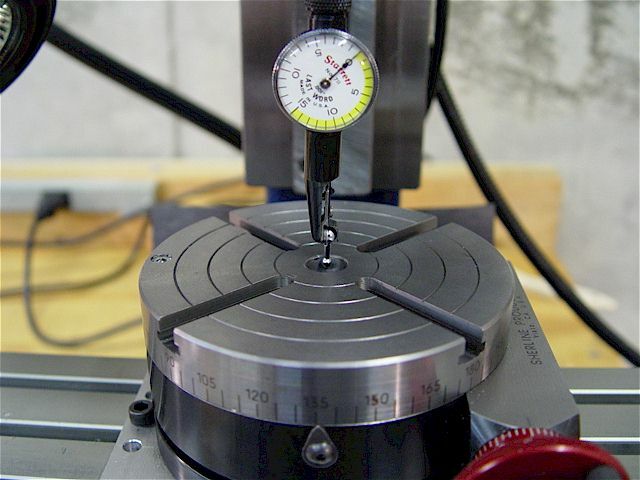 maximum weight limit for the rotary table.